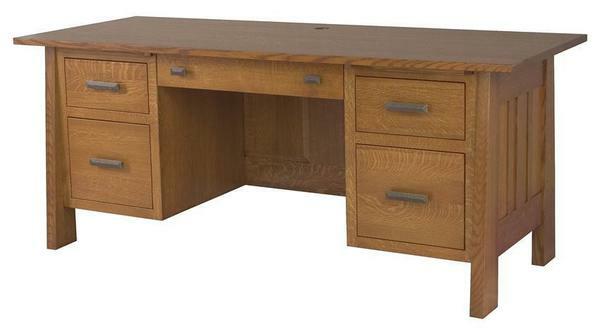 Adding mission style with the Amish Furniture Freemont Mission Executive Desk means you're ready to get down to business. This solid wood mission desk offers plenty of storage and work space along with a versatility that bodes well with a contemporary decor or a traditional setting. Available in three custom sizes, the Freemont is efficient and attractive, with a cord hole hiding away plugs and attachments, full extension drawer slides that allow access to the most space in each drawer along with a self closing style. The side panels of the Freemont feature mission style slats and the back of the desk is finished, allowing placement anywhere in the room. The desk top is a firm 1" thick and you can choose to have a pencil drawer or keyboard pullout built in.